Brad Entwistle founded Australia’s leading school marketing firm, Imageseven, in 1990. The firm services independent and Catholic schools across Australia. Entwistle’s long-term vision to bring corporatelevel marketing professionalism to the education sector led him to develop a systematic approach to school marketing that has revolutionised the practice and outcomes for Imageseven’s clients. 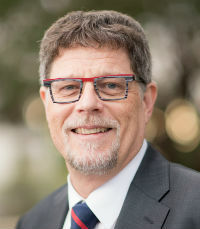 His ‘insight applied’ approach of generating strategic insights that can be translated into meaningful real-world execution has earned respect from school heads around the globe. Entwistle and his team of 26 marketing professionals have forged successful partnerships with schools by being able to work alongside school heads, school boards, staff and parents. Always preferring to place the client in the foreground, Entwistle has quietly supported heads and school marketing teams through times of change, marketplace disruption and enrolment stress.